Who doesn’t like to buy souvenirs in Disney World? My family is obsessed with finding the best souvenirs. Not just regular Mickey ears, but we need the best souvenirs. We’ve spent countless hours combing all of the shops high and low and I’ve come up with these top 5 places for souvenirs in Disney World. Found in Disney Springs, World of Disney is the largest Disney store in the world and they have everything. I mean if you see something in one of the shops in the parks and think you might want it, there is a good change you can find it in World of Disney. This is a great option for families that want to look and not buy. We like to plan a trip to this mega-store toward the end of our vacation (if not multiple trips) and get any souvenirs we saw but couldn’t live without. World of Disney has clothes, toys, jewelry, housewares, etc. If you can’t find a great Disney souvenir here, you aren’t looking hard enough! Found on Hollywood Blvd in Hollywood Studios, this shop is really cool. It’s not huge, but they have some great clothes that are not found anywhere else. The styles are definitely different from the typical Mickey souvenirs. They also have some neat accessories too. I highly recommend checking this store out when you go to Hollywood Studios. You won’t be disappointed. Found in the Japan pavilion in Epcot, this store is really unique. You might have thought I was going to recommend Mouse Gear for the best shop in Epcot, but no. Everything in Mouse Gear you can get in World of Disney (and more). Save your time and check out this awesome Japanese department store where you can choose oysters for their pearls, purchase samurai swords, and visit their sake bar. 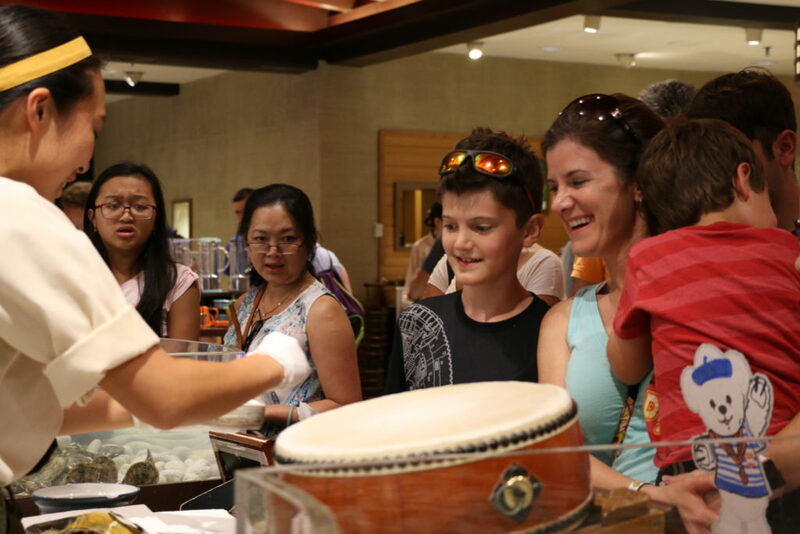 Here are Leslie and the kids choosing a pearl in Mitsukoshi. Found in Africa in the Animal Kingdom, the Mombasa Marketplace is a great place to get Disney souvenirs with an African flare. We’ve gotten authentically carved animals (the guy is carving them as you browse the inventory) and really neat African-themed clothes. They also have other African art with Disney themes, toys, and wine. They even have a great snack case where you can use your snack credits. For us, this is a shop that we can never miss. Check this one out! Okay, so I know I should’ve picked a shop in the Magic Kingdom for my last one here. But really, I’m not that impressed with the shops in Magic Kingdom. They’re okay, but you can get most of that stuff in World of Disney. I have to go with The Lego Store here. Our kids absolutely love this store. They have giant sculptures made from Legos all around the store, you can buy bulk legos in any color they make, you can make your own Lego guys, and they have special Legos for sale that you can’t get anywhere else. This place is awesome! 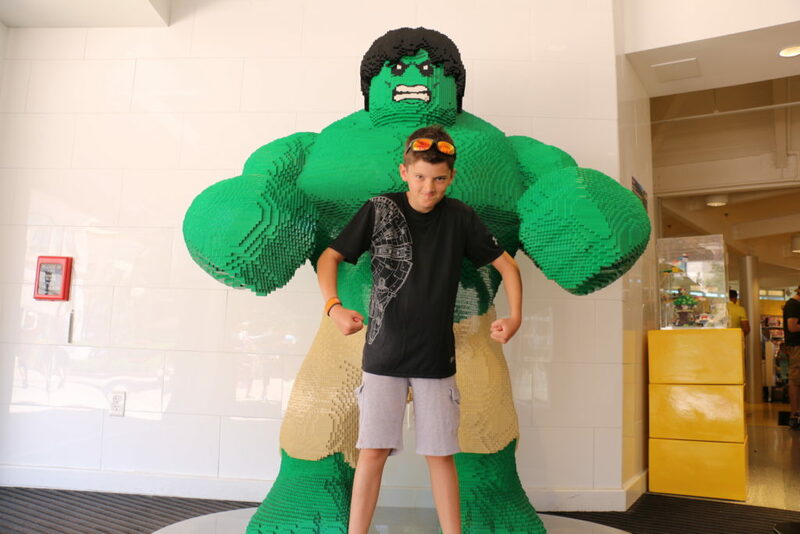 Here is Aidan with a Lego Hulk!